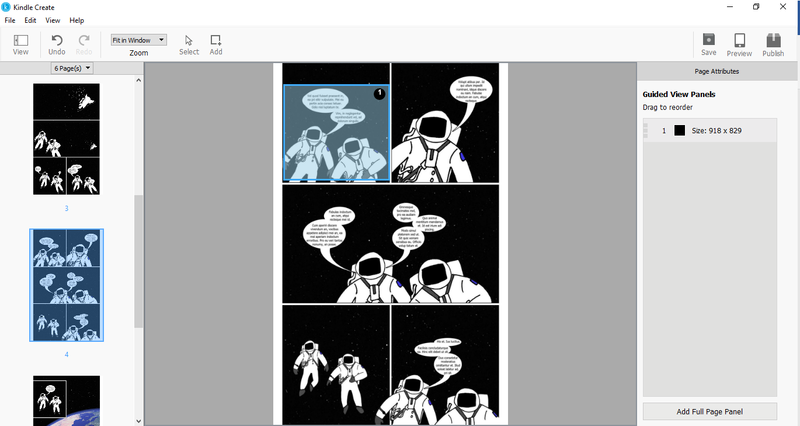 When you import your comic PDF into Kindle Create, your file is converted to a comic eBook and you can add Guided View panels. After installation, you can launch Kindle Create by choosing Windows key > Amazon > Kindle Create (Windows) or Launchpad > Kindle Create (Mac). This feature is disabled by default. To enable comics, choose Help > Settings > Early Access (Windows) or Kindle Create > Preferences > Early Access (Mac) and then check the Enable Beta Features box. Kindle Create restarts to complete the process. On the Kindle Create launch screen, click the New Project from File button. You can also launch a new project by choosing File > New Project or using the shortcut CTRL + N (CMD + N for Mac users). The Choose File dialog box is displayed. Click the Comics with Guided Panel View option. Click the Choose File button, navigate to the PDF on your local hard drive, choose the file, and click Open. 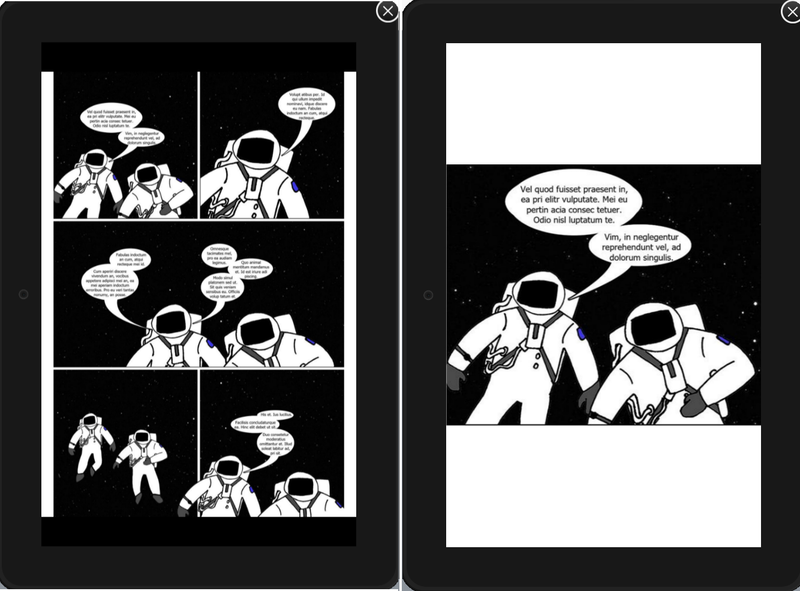 Your comic is imported and displayed in Kindle Create. When you click Save, Kindle Create stores your book’s KCB file and other resources in the folder you specify. Amazon recommends saving and backing up this KCB file, which is required for any future updates to your book. You can resume a previously saved project by choosing Resume Existing Project or File > Open Recent and choosing the relevant KCB file. When you click Publish, Kindle Create produces a publishable file (KPF) that you can submit to KDP. The KPF file is only used for publishing. The KCB file is used for updates. Click the Add button and drag the cursor across the area you want to magnify. Adjust Width and Height to change the size of the panel. Adjust Left and Right to change the position of the panel. Use Mask to change the mask color around the panel. Use Opacity to change the transparency of the panel. To delete the panel, click the trashcan. To change the order in which the customer will read the panels, drag the entries in the Page Attributes panel. Continue adding Guided View panels to the parts of your book that should be magnified. Right-click the page where you want to insert a page. Click Insert page(s) in the menu that appears. The new page will appear after the page you right-clicked. Go to the Pages panel in Kindle Create and right-click the page you want to delete. Click Delete selected page in the menu that appears.